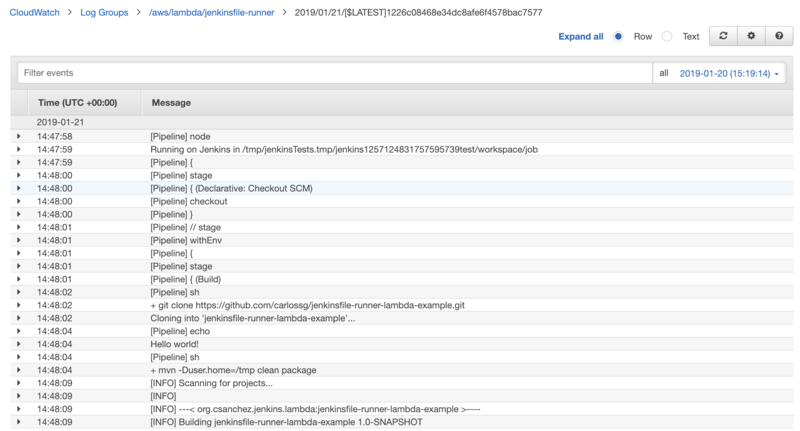 The Jenkinsfile-Runner-Lambda project is a AWS Lambda function to run Jenkins pipelines. It will process a GitHub webhook, git clone the repository and execute the Jenkinsfile in that git repository. It allows huge scalability with 1000+ concurrent builds and pay per use with zero cost if not used. This function allows Jenkinsfile execution without needing a persistent Jenkins master running in the same way as Jenkins X Serverless, but using AWS Lambda instead of Kubernetes. All the logs are stored in AWS CloudWatch and are easily accessible. I mean, it could make sense to run Jenkinsfiles in Lambda when you are building AWS related stuff, like creating an artifact and uploading it to S3. You can add your plugins in a new layer as a zip file inside a plugins dir to be expanded in /opt/plugins. You could also add the Configuration as Code plugin and configure the Artifact Manager S3 to store all your artifacts in S3. The layers are built with Docker, installing jenkinsfile-runner, tools and plugins under /opt which is where Lambda layers are expanded. These files are then zipped for upload to Lambda. Create a lambda function jenkinsfile-runner using Java 8 runtime. Use the layers built in target/layer-* and target/jenkinsfile-runner-lambda-*.jar as function. Could use make publish to create them. From the lambda function configuration page add a API Gateway trigger. Select Create a new API and choose the security level. Save the function and you will get a http API endpoint. Note that to achieve asynchronous execution (GitHub webhooks execution will time out if your webhook takes too long) you would need to configure API Gateway to send the payload to SNS and then lambda to listen to SNS events. See an example. Add a GitHub json webhook to your git repo pointing to the lambda api gateway url. More information in the Jenkinsfile-Runner-Lambda GitHub page.